Promoting Hinduism? 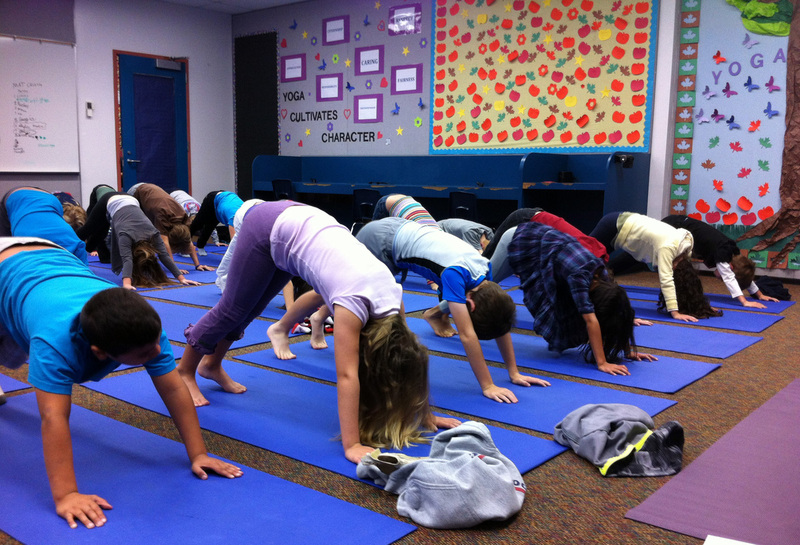 Parents Demand Removal Of School Yoga Class Encinitas, Calif., is celebrated by many as the yoga mecca of America. But when the spiritual discipline was recently incorporated in a local school, a group of parents quickly likened it to religious indoctrination. They worry the new model will be exported to schools across the country. Third-graders at Olivenhain Pioneer Elementary School in Encinitas, Calif., perform chair pose with instructor Kristen McCloskey last month. During first period at Olivenhain Pioneer Elementary School in Encinitas, Calif., Kristen McCloskey leads about two dozen third-graders through some familiar yoga poses. "All right, so let's do our opening sequence A," she says, instructing the kids. "Everyone take a big inhale, lift those arms up. Look up." At the end of the half-hour class, 8-year-old Jacob Hagen says he feels energized and ready for the rest of the day. "Because you get to stretch out and it's good to be the first class because it wakes you up," he says. Schools across the country are focusing more on teaching students to make healthy choices; Encinitas Superintendent Tim Baird says yoga is just one element of the district's physical education curriculum. "We also have a nutrition program," he says. "We also have a life-skills program where kids learn about perseverance and responsibility." The whole wellness program is supported by a $500,000 grant from the K.P. Jois Foundation. The Encinitas-based group promotes a kind of yoga called Ashtanga, which was introduced to Encinitas from India in 1975 by founder Krishna Pattabhi Jois. But when Mary Eady visited one of the yoga classes at her son's school last year, she saw much more than a fitness program. The third-graders at Olivenhain Pioneer take three deep breaths in the downward dog position during one of their two weekly yoga classes. "And then the question becomes — if it is religious, which it is, who decides when enough religion has been stripped out of the program to make it legal?" Broyles says. "I mean, that's the problem when you introduce religion into the curriculum and actually immerse and marinate children in the program." Critics of the yoga class launched an online petition that garnered about 260 signatures as of Friday, about 50 of them voluntarily identifying themselves as parents in the district. Another online petition, in support of the class, had more than 2,700 signatures, which are anonymous to those who don't sign. Eady and the other parents working with Broyles want the classes made completely voluntary and moved to before or after the school day. They say school officials haven't responded to their concerns. Opponents worry that the class will be adopted in schools across the nation. They point to the Jois Foundation's funding of researchers at the Universities of San Diego and Virginia to study whether the yoga classes affect things like attendance, behavior and student achievement. "It is the stated goal of both the Jois Foundation and the district itself to prove scientifically that Ashtanga yoga works for kids here in the district and then export it nationally," Broyles says. Jois Foundation Director Eugene Ruffin, however, maintains that the yoga program is typical of athletics programs for kids. "They provide you with the exercise and the motivation for children," Ruffin says. "And then they give you character exercises — 'Thou shalt not steal, thou shall be honest, thou shall be respectful to adults.' "
Ruffin says those ideals aren't specific to Hinduism and don't conflict with his own Catholic upbringing. Despite the controversy, most parents, like Monique Cocco, are happy with the classes. She says her children don't come home with a newfound knowledge of Hinduism. "Absolutely not — no. What my daughter tells me is she did the pancake today and she lays down and then she cracks up because it's so funny," Cocco says. Cocco hears from teachers that kids are calmer and more focused after yoga, so the teachers can spend more class time on lessons, instead of settling kids down the way they sometimes have to after traditional gym classes. When winter break ends Monday, the school district is moving forward with plans to have the classes taught at all nine Encinitas schools.